An influential yet under-recognized artist of his generation, Foulkes makes work that stands out for its raw, immediate, and visceral qualities. Coming from a tradition of West Coast artists working in assemblage in the ’60s, such as Ed Kienholz and Bruce Conner, Foulkes has consistently challenged audiences and expanded his work into new territories. His presentation at the New Museum will feature nearly one hundred works from the scope of his fifty-year career. These range from the emotionally charged constructions of the early 1960s and his impeccably painted landscapes of the American West, to his deeply disturbing portraits from the late 1970s and his remarkable recent narrative tableaux, which seamlessly blend painting with found materials to create an extraordinary illusion of depth. His diverse body of work resists categorization and defies expectations, distinguishing Foulkes as a truly unique and significant artistic voice. Llyn Foulkes (b. 1934 Yakima, Washington) studied music and art at Central Washington College of Education until he was drafted into the US Army in 1954. After two years of service in postwar Germany, he studied at the University of Washington before moving to Los Angeles in 1957 to attend the Chouinard Art Institute. In 1959, he was included in a group exhibition at Ferus Gallery in Los Angeles, where he later had his first solo exhibition in 1961. Shortly after, his first solo museum exhibition was held at the Pasadena Museum of Art in 1962. Foulkes has been included in many important group exhibitions including “Whitney Museum Annual of American Painting,” Whitney Museum of American Art (1967); the Ninth São Paulo Biennial (1967); and the Paris Biennale (1967). He formed his own band, Llyn Foulkes and The Rubber Band, in 1973, which performed at various venues including The Tonight Show Starring Johnny Carson in 1974, and in 1979 he began building his epic music Machine, which he continues to perform on today. Foulkes received a Solomon R. Guggenheim Fellowship in 1977 and had his first survey exhibition at the Museum of Contemporary Art in Chicago (1978). His first retrospective was held in 1995 at the Laguna Art Museum (traveled to Cincinnati, Oakland, and Palm Springs), and he was featured in “Helter Skelter: L.A. Art in the 1990s” at the Museum of Contemporary Art, Los Angeles (1992). In 2008, he was awarded the American Academy of Arts and Letters Award, and in 2009, he received the Artists’ Legacy Foundation Award. In 2011, he was featured in seven “Pacific Standard Time” exhibitions at institutions in Southern California and the Venice Biennale, and in 2012 his paintings were included in Documenta 13, where he also performed. “LLYN FOULKES” is organized by the Hammer Museum, Los Angeles, and is curated by Ali Subotnick, Curator. The New Museum’s presentation is organized in conjunction with Subotnick by Margot Norton, Assistant Curator. After its presentation at the New Museum, the exhibition will travel to the Museum Kurhaus Kleve, Germany. 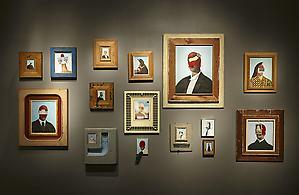 The exhibition is first on view at the Hammer Museum, Los Angeles, from February 3–May 19, 2013. The exhibition is accompanied by a fully illustrated catalogue including essays by novelist and art critic Jim Lewis, writer Jason Weiss, and curator Ali Subotnick.